Happy birthday George Shannon (Tomorrow's Alphabet), Phyllis Root (One Duck Stuck), and Shana Corey(Here Come the Girl Scouts!). Happy birthday Oregon and Arizona. Read My Great-Aunt Arizona by Gloria Houston, illustrated by Susan Condie Lamb. 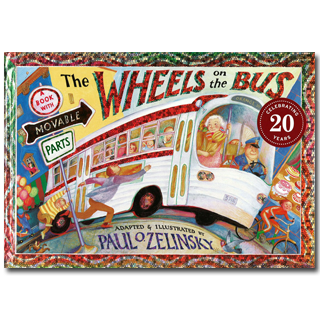 Today marks the birthday of one of the most versatile and accomplished illustrators working today, Paul O. Zelinsky. My major problem in writing about Paul was deciding which of his many superb books to feature. Born in 1953 in Evanston, Illinois, Paul lived in several locations because his father was a college professor. He discovered that by being “class artist” he had a skill that allowed him to connect with other students. While at Yale Paul became a student of Maurice Sendak, who was teaching there at the time. Although I missed Paul’s first book, I became aware of his talent with The Maid and the Mouse and the Odd-Shaped House, published in 1981, still fresh and original today. Paul began to make frequent appearances on the New York Times best illustrated list and won Caldecott Honors for Rika Lesser’s Hansel and Gretel, Anne Isaac’s Swamp Angel, and his own adaptation of Rumplestiltskin. Paul would eventually win illustration’s top award for Rapunzel. 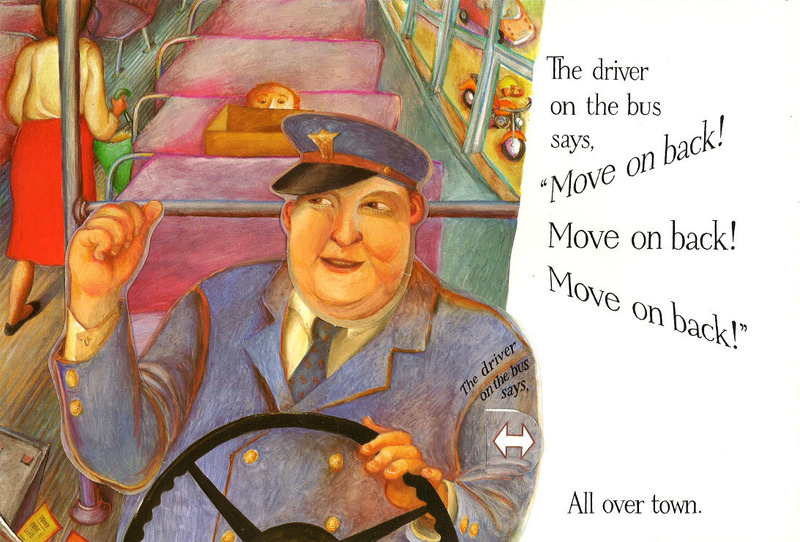 Paul’s very popular The Wheels on the Bus, a book with movable parts, has gone sailing into classic status. In the hands of Paul Zelinsky the novelty format is never gimmicky or cheap. Wheels turn and doors open; wipers go swish, swish; and riders go bumpety, bump. The final double page spread shows the trip made by the bus. The jaunty text of the song keeps children reading and singing along. The book certainly has given pleasure to thousands of preliterate readers and their parents. Although the book has been manufactured with thick, sturdy pages, I always recommend buying two copies of this book. One will probably be worn out before long. Happy birthday Paul. You have created one great book after another – all made with care, attention to detail, and a belief that children deserve the best. Originally posted February 14, 2012. Updated for . Happy Birthday! And Happy Valentine’s Day too! This book looks just great. I would think kids al over would love it. Thanks for telling about it. I love Paul Zelinsky!! Thank you for featuring this book (which I have used multiple times with preschoolers)! To the owner of this marvelous most happy online home, for all things bright and beautiful: Children’s books. You literally gave me a new place in the heart. 100 Best Books for Children, and all that came to me, from reading those book, for the first time. Happy Valentine’s Day, Lady Anita. Gordon: And Happy Valentine’s Day to you. I love reading your post on the website, one of my best gifts in the past year and a half. I just got hands on this book, and the art is just a treasure. The interaction of the pull-tabs along with the simple repetition of descriptive phrases make for a delightful experience. I think I was grinning at every tab on every page. I’ll have to buy this one. I don’t know this particular book, but I love Paul Zelinsky’s artwork. Just looking at the cover, I think it’s wonderful how the information about the movable parts is incorporated so completely into the illustration. In addition to it being the birthday of the state of Arizona, today is also the state of Oregon’s birthday. It’s my birthday too, and born in 1953, glad to be in illustrious company! I am so happy I backtracked to see the books I’ve missed during my internet outage! Seeing Wheels on the Bus just brought back so many great memories. I loved this book when I was a child – I grew up in London and my librarian aunt sent this to my sister and me as a Christmas gift one year and we read it so much the movable parts became close to unhinged, just as you said in your review. My favorite scene was the one with the windshield wipers. I’m going to see if I can find it at the library to read through it again – this was (is) such a great book. I love Zelinsky’s work. The artwork in this book is amazing. And the fact that it is interactive just makes it that much more fun to read. I love his “Rapunzel” best. The oil painting illustrations are so Italian Renaissance–and so pretty! But we certainly wore out our own family copy of “Wheels on the Bus”! This is a favorite older sibling baby present for my friends/family with new babies! I love this book! I didn’t remember that Paul did THE MAID, THE MOUSE…another favorite book to share with younger students studying shapes. But my personal favorite of his is SWAMP ANGEL! I really thought it should have won the Caldecott that year instead of just an honor. Thank you again, Anita, for sharing your stories with us! A special Valentine to be sure!